Here are some posts provided by Amelia Mickelsen, the 2018 Swank Traveling Fellow, as she studied the pilgrimage route of Santiago de Compostela in Spain. 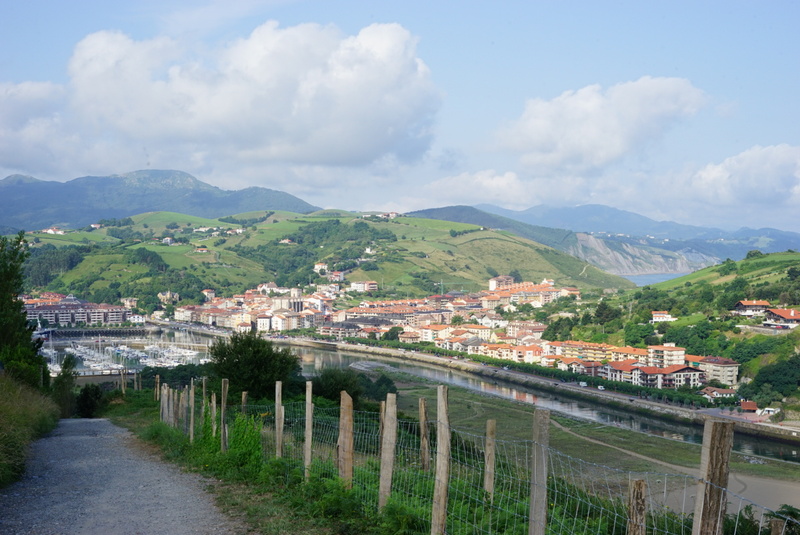 The Camino del Norte traditionally begins in Irun, a small coastal town near France. For the first part of my journey, I will be in Basque Country, an Autonomous Community granted nationality in Spain in 1978. I later learned from a friend on the pilgrimage that it is essential to be respectful of the different customs of each region because the culture of Spain is not unified. As I walked through the cities, I began to notice signs alluding to this division. The Camino de Santiago is a pilgrimage route, originally following a Roman trade route across the Iberian peninsula. Also called the Way of Saint James, the Camino has multiple routes stretching across Germany, France, and Italy. In the past 50 years the Camino has grown in popularity. 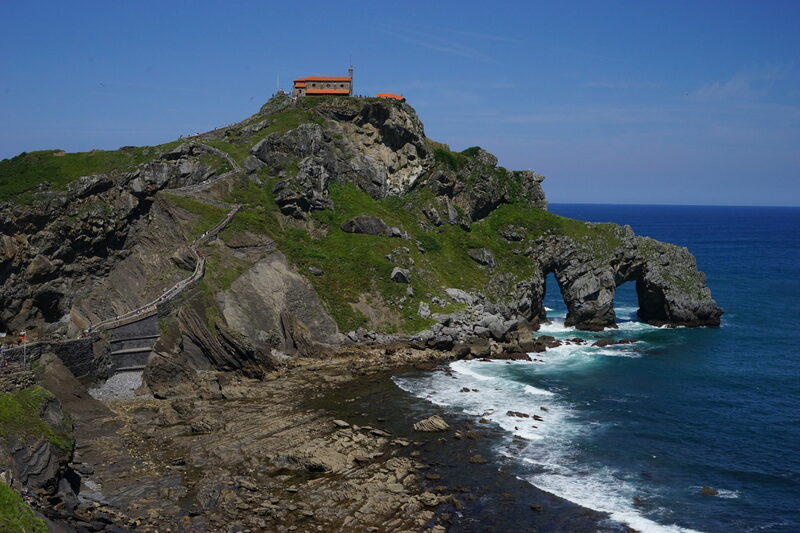 I choose the Camino Del Norte for its spectacular ocean views and architecturally significant cities. Upon arrival in Irun, I went to an Albergue to get my pilgrim documents. The pilgrim documents are essential to the pilgrim's journey because each stop has Albergues reserved solely for pilgrims to sleep. Albergues are similar to hostels, and they are often donation based or reasonably priced at 13-18 euros. Because I am traveling in July and August, the most popular time of year for pilgrims many of the inexpensive hostels fill up quickly each day, and it is impossible to book them ahead of time. The rhythm of the walk each day is set by each person and their desire to have an inexpensive bed that night. The walk from San Sebastián to Irun is one of the most beautiful and challenging. I climbed over 700’ watching Irun disappear behind rolling pastures and small stone ruins. The stone towers became a place for pilgrims to gather, rest in the shade, and eat lunch. The Northern Route has far less infrastructure than the more popular Camino Francis. By mid-afternoon, I realized I had run out of water, and I would not reach the next town for another two hours. The road to Santiago changes dramatically in a matter of minutes, from grassy hilltops to highways and muddy forests paths. The only constancy in the path is the presence of the yellow arrow guiding the pilgrim to Santiago. 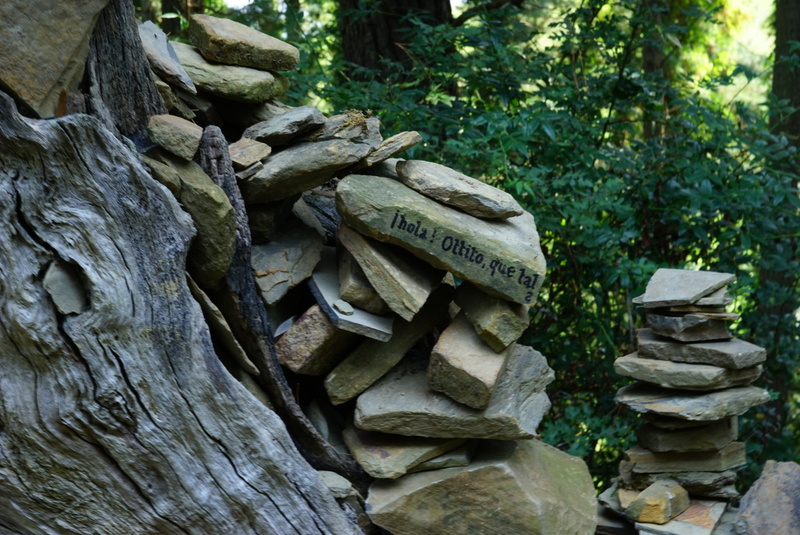 The arrows are painted on stones, trees, fences, trashcans, and any other nearby object with some permanence. While walking, I often wondered if I would happen upon someone repainting a faded yellow arrow. By four in the afternoon, I reached a municipal Albergue in Pasajes de San Juan, a tiny finishing community. The municipal Albergues are sponsored by the local government, and they come in all shapes and sizes. The Albergue De Santa Ana is a stone cottage resting at the highest point of the village, overlooking the inlet. As I watched the sunset across the water, I felt a great sense of pride upon completing my first day of the Camino. 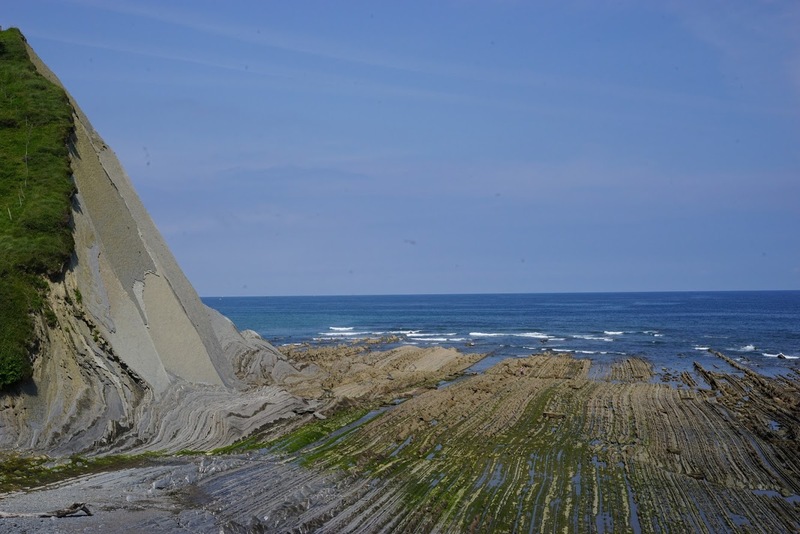 As the days passed, and I walked through Orio, Zarautz, Getaria, Zumaia, Deba, and Markina-Xemein, I noticed a rhythm to the landscape and the fishing and whaling towns nestled between the mountains on the Northern shoreline of Spain. I favor walking when I want to understand architecture and space because it allows me to understand the spaces in-between. In an age of rapid transportation, it is easy to focus on a location as if it is a place or a point in space and it is possible to miss the transitional moments. When one walks from city to city, the idea of a town as a location or a point is dissolved and the walker simple becomes a vector observing the slow transition from a road, to a dirt path, to grass, to a stone, and road again. When walking the coastline of Spain my movement in direction and through time follows a specific rhythm set by the ancient people who first populated these coastal fishing villages. I am on the road early and as I leave the town I begin ascending the mountains and hills, the path is often steep, stone steps sometimes facilitate the climb. After a few hours I have reached the highest point of my climb for the day, I am usually able to see the city behind me, and if I am lucky might also glimpse the town in front of me. By 11:00 AM, or noon the path is more even, I wind through sloping hills with farms, raising cattle, goats, sheep, and forests. As I approach 2:00 PM I might pass vineyards and my steps quicken as the path descends and I view the ocean and the town ahead. I often marvel at the stunning landscape as I walk. Each moment is equally beautiful but changing with each step I take. For the sake of time, I have to remind myself not to snap a shot with my camera every step of the way. Although the coast provides some of the most stunning views, it also offers dangers. The path often wholly disappears. I might walk over twelve miles without passing a town or spring for fresh water. On one occasion I had walked for over two hours without water. A kind hiking group from Santiago rescued me. The hiking group saw my exhaustion and thirst, offered me water, and walked with me the remaining three miles to Deba. In the Albergues, I often hear pilgrims tell stories of rescue and good fortune concluding the tale with the phrase ”the Camino provides. ” After my experience with the hiking group, I began to find truth in this statement. 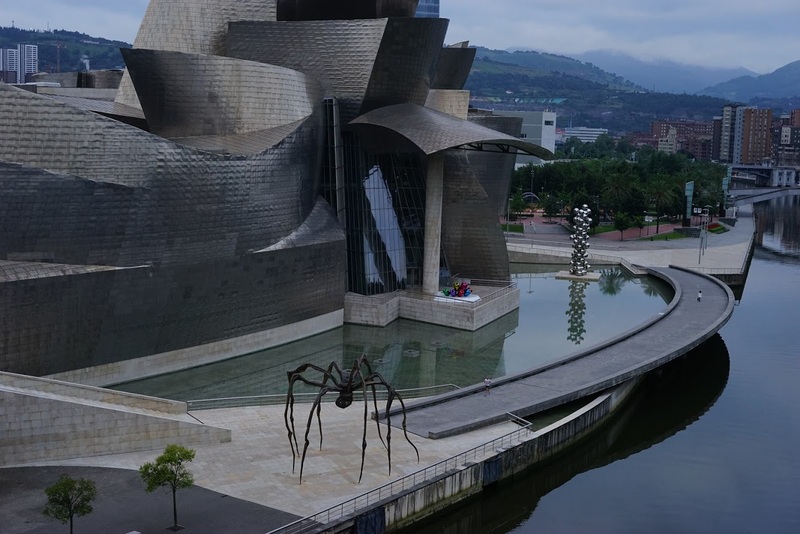 A week and a half had passed since my arrival, and I stopped to rest in the vibrant city of Bilbao. Frank Gehry’s Guggenheim has touched every corner of the town, so that eye always catches on a silver glint of metal or glass. The more significant buildings in the city swoop and twist as if the were the Guggenheim's distant cousin. Gothic churches harmoniously rest in the vertices of the triangulations made by the streets following a circular city plan. The next sizeable seaside city is Santander. I was impressed by the Botín Center by Renzo Piano, and it's extensive Joan Miró collection. Even on days of rest, the Camino tempts me, and I feel an urge to walk. 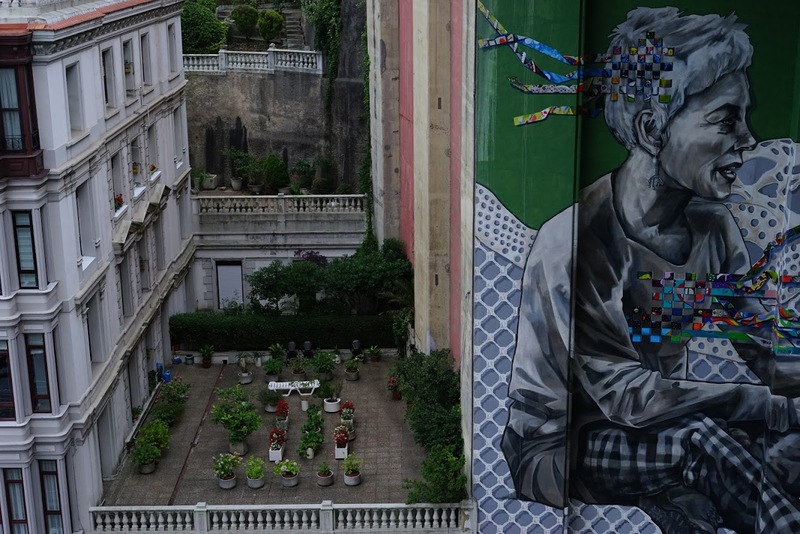 Santander has a lookout platform offering beautiful views of the city. Many choose to take the lift up the incline, but the steep flights of stairs seemed to beckon me with a twisted smile, and I recalled the mountains I had climbed earlier in the week as I lightly ascended to the top to take in the views of the harbor.